Hello, dear artists and fans of cool cars. 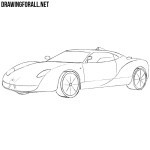 As you already know today we will show you how to draw a Maserati. Maserati – is an Italian company, the manufacturer of exclusive cars of sport and business class. It was founded in 1914 in Bologna, Italy. The emblem of the company is a trident, an element of the Neptune fountain in Bologna. So, let’s begin this lesson. So, we always start our drawing lessons from common lines. 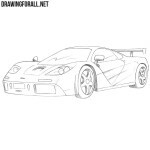 Use the straight lines to sketch out the car body as in our example. 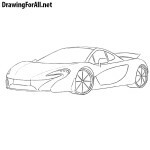 With the help of curved lines sketch out the wheel arches and wheels. Do not forget that all the lines on the first steps should be the easiest. Let’s start adding details, and we’ll do it in front of the car. Draw the hood and headlights. Use clear and dark lines in this and next steps. Get down a little lower and outline a grille with a trident emblem in the center. 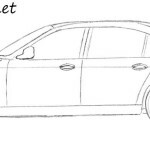 A little lower draw the bumper with air intakes as in our example. Now we rise a little higher and draw out the roof of our Maserati and the windows. On the sides of the car draw the rear-view mirrors. So, we continue to draw the Maserati. In this step we draw the door, the handle and the back of the car. 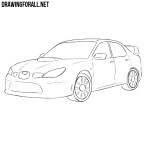 With the help of clear and even lines draw wheels and wheel arches. The lesson about how to draw a Maserati came to an end. It remains only to add shadows and draw rims. Draw out the wheel rims, which as we always say can be of any shape and any type. Using short strokes we draw shadows. We try to make useful and interesting drawing lessons. 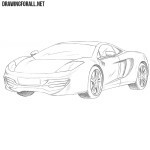 You can help us, just share this drawing lesson and write your opinion under this article.